Our order picking trolley range includes the well known Clax Trolley, Cox's own Order Picking Trolley, Prestar Trolleys and many Trolley accessories and additional boxes. Purchase online through our website or contact us for more information. Clax Cart Clax Trolley - 2 Tier Collapsible Folding Trolley comes with one collapsible crate. Push button folding for storage. Prestar Slim Cart Supermarket Stacker is a narrow trolley with an adjustable shelf and additional shelves available leaving more aisle room for shoppers to pass while restocking shelves. Worktainer Cage Trolley with high volume capacity , manoeuverable, Door option Lightweight base. 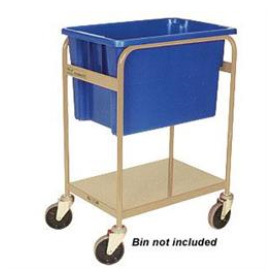 Side by Side Twin Bin Order Picker Trolley .Standard beige. Underbench (options extra)Console ideal for labels, tape, pens, etc. Stainless steel fixed frame trolley to suit two foldable Clax baskets.